Yesterday SpaceX planned the trickiest rocket landing yet. Unfortunately technical glitches meant it had to delay the attempt until today. And an extra day was exactly what SpaceX needed! 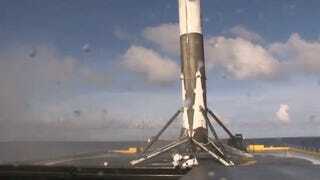 The Falcon 9 rocket landed on the drone ship Of Course I Still Love You. Science fiction fans like our own inestimable Andrew Liptak, note that is also the name of a vessel from an Iain M. Banks novel.